A qualified expert with all known military flame-throwers, pyrotechnics, and heat-projection devices, BLOWTORCH is also extremely proficient in defending against them. He is currently studying for advanced degrees in both structural and chemical engineering because he feels that he can't ever know too much about the weapons he uses and has used against him, and about the structures he might be called upon to attack or protect. Harsh arctic weather conditions reduce the effectiveness of flame weapons, which is why BLOWTORCH has a personal bone to pick with COBRA SNOW SERPENTS. Aside from his rather annoying habit of pushing the "test" button on every smoke detector he comes across, BLOWTORCH is fairly realistic and practical. Unlike a pyromaniac, he would much rather see a flame extinguished than ignited. Why would somebody who thinks like that want to work with flame weapons? Because he wants the fire to be under control, and he thinks he's the best one to do it. "Fire is supposed to be our friend, but when we get careless with it, we find out just how ferocious an enemy it can be." Contribute pictures, update details or suggest corrections for Blowtorch vs. Cobra Snow Serpent. 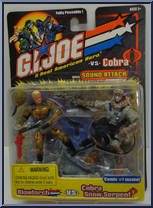 Write a review about Blowtorch vs. Cobra Snow Serpent.